Research conducted at Princeton University's biology department discovered that squirrels are far from squirrelly when it comes to food. It was assumed previously that gray squirrels couldn’t remember where they buried their nuts and probably relocated them by their odor. This assumption was tested by releasing some gray squirrels into an outdoor arena with a bag of 10 hazelnuts. After several days, each squirrel was returned to the arena and tested for their ability to retrieve the nuts. 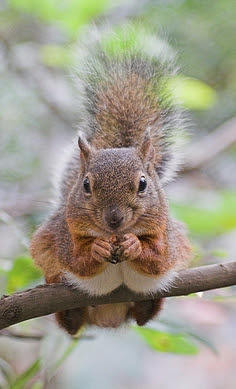 Although they hid their nuts close to each other, the squirrels retrieved mainly nuts from their own hidey-holes rather than from sites used by other squirrels. The retrieval accuracy of the squirrels under these conditions indicates that while gray squirrels can locate buried nuts by their odor, they can also remember the individual locations of nuts they have buried personally. The study suggests that squirrels bury food in a series of locations, near landmarks, that help them form a cognitive treasure map in their head. Squirrels will also often dig up and rebury food to determine whether the food stored is still good or perhaps to help refresh their memory. Reminds me of the chapter on Clark's Nutcracker from the awesome "The thing with the feathers". They also use mental maps.